This is my second post for the day. Please scroll down one post to see my Framed Butterfly card. My new Market Street Stamps (Gingham, Grace) were calling to me, so I put them to work on this card. I stamped "Grace" in London Fog (it's Memento ink, and isn't that the greatest ink name?? ), and "Gingham" in Scattered Straw Distress ink. I am LOVING these stamps! See the bit of lace where the two patterns meet? The little panel features a Hero Arts script stamp, and three images from Stampin' Up! 's Artistic Etchings set. Behind it, I used a Parisian Motif Spellbinders die cut, made with Crumb Cake cardstock, cut in half and adhered to the panel. I just couldn't find a home for a sentiment on this card, but I intend for it to be a sympathy card for a friend who is far away. 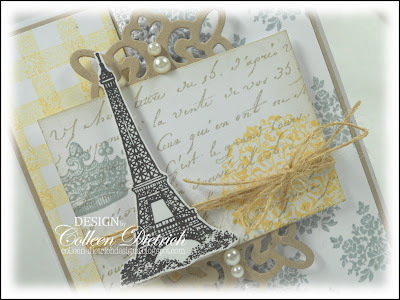 This is lovely Colleen, I love the softness of your card and the romance of Paris...so pretty. Everything about your card flows together beautifully Colleen. Love your perfectly placed pearls! Great double challenge card, Colleen! Love the nestie in the BG and the script on the panel. Oh my Colleen! This is so gorgeous!! I love your stamped panel. It flows perfectly with the BG papers. Wow! Colleen, such an elegant and stylish sympathy card. I really like the pearl accents on the diecut. Thanks for playing along with CR84FN! What a gorgeous card - and the Eiffel Tower is just the right touch. This is gorgeous, Colleen! 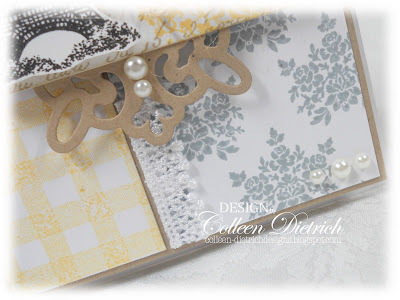 I love this color combo, and you did a fabulous job mixing so many different stamps for this. Beautiful! I think it will be wonderful sympathy card. gorgeous card...love how you used that die cut and love background stamps.. Your card looks wonderful. I love those soft yellow colors. Goes so well with the kraft color. Absolutely gorgeous Colleen! I love that Eiffel Tower image, and paired with the damask, it makes for a very elegant card! My oh my am I happy I opened this blogpost :) Woohoo!!! I think I see a winner. And you deserve to win! But there is so much more to beauty to look at. 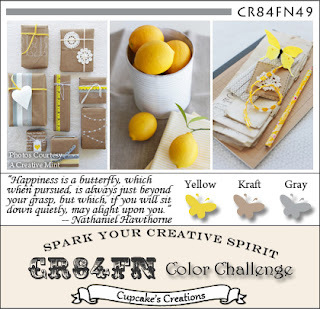 I love that Parisian Motif die and that yellow flower (am i right? is it a flower?) is priceless. So, so, so, so soft and lovely. Love how you worked the kraft into your card. Another beauty showcasing your amazing stamping skills! I always love your paris cards too! Love how you used the diecut too! This card doesn't need a sentiment! It's gorgeous as it is! I love the color combo here and the gorgeous die cut. So pretty what you did with this sketch. This is absolutely beautiful, girl! So much to love, but I especially LOVE all that stampy goodness! This is a wonderful sympathy card, Colleen. Love the colors you used and the awesome stamps. Wow, girl! What a lovely palette of colors...and your take on Amber's design is fabulous! The frame really stands out wonderfully!